Vitamin C (ascorbic acid, ascorbate) is a water-soluble vitamin that is an essential cofactor for the human body, for instance in the catabolism of tyrosine and the synthesis of catecholamines. Regular consumption of fruit and vegetables is usually sufficient to cover the body’s vitamin C needs. In the case of vitamin C deficiency, procollagen chains are produced insufficiently and stable fibrils cannot be formed in the affected cells. Without functioning collagen, the blood vessels and tendons become fragile and the typical skin-related symptoms associated with scurvy start to develop. In addition to the collagen damages described above, further diseases caused by vitamin C deficiency include bleeding of uncertain origin, loss of teeth and overactive thyroid gland (hyperthyroidism). Vitamin C deficiency is also observed in dialysis patients, in chronic alcohol abuse and during pregnancy. 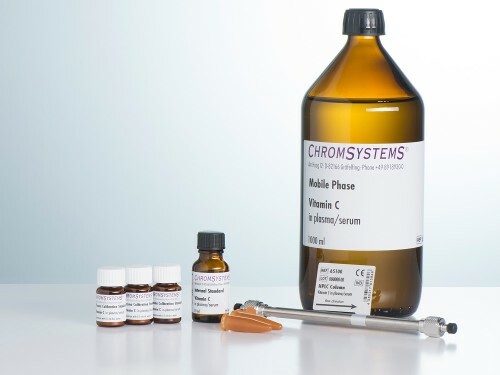 This Chromsystems kit allows the reliable chromatographic determination of vitamin C in one isocratic HPLC run with UV detection. 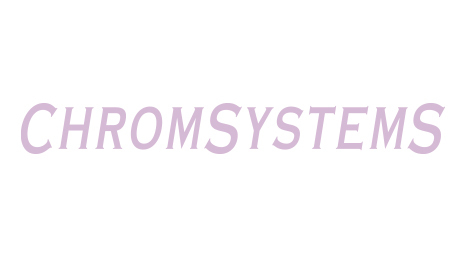 An efficient protein precipitation step removes interfering components and stabilises Vitamin C simultaneously. A stable internal standard is used for reliable quantification. Due to a special stabilisation of the prepared samples, it is also possible to reliably process and measure large sample batches. Reaction vials, amber coloured (light protection), 100 pcs. Any isocratic HPLC system with UV detection is suitable. Fresh lithium heparin plasma is used for analysis. To minimise the oxidation of vitamin C the whole blood sample should be centrifuged immediately after collection and the plasma samples must then be transported deep frozen. Start sample preparation immediately after thawing. If whole blood is used for transportation, store at +2 to +8 °C , do not freeze. Pipette 100 μl sample/calibrator/control into a labelled light protected reaction vial. Add 100 μl Internal Standard and mix 30 s (vortex). Centrifuge 5 min at 15 000 x g.
Inject 20 μl of the supernatant into the HPLC system. The stability for vitamin C in heparin plasma is 5 days at -20 °C. At room temperature this is only up to two hours. For the Chromsystems HPLC analysis of vitamin C any isocratic HPLC system with UV detection is suitable.